The Abbot Orsini states that Our Lady of Clermont was located ten leagues (perhaps 30 miles) from Cracow, Poland. At some point in the Middle Ages there was a picture of the Blessed Virgin believed to have been painted by Saint Luke that was displayed there and annually taken on procession. According to this account, the picture was originally sent to the Empress Saint Pulcheria, a princess, who placed it in the Church of Our Lady of the Guides, at Constantinople. From there it was taken by Leo, Duke of Russia. The Duke of Opolia wanted to remove it to his duchy in the year 1380, but when he had got to the mountain of Clermont, it became so heavy that it was impossible to carry it farther; and seeing by this miracle that the Blessed Virgin had chosen that mountain for her abode, they built a church there. The Empress Saint Pulcheria was certainly a real person, living in Constantinople in the 5th century. Her full name was Aelia Pulcheria, and her father was Arcadius, Emperor of the Eastern Roman Empire. When the emperor died, Pulcheria’s seven year old brother Theodosius was made emperor, though there was a regent necessitated by his young age. When Theodosius became a teenager, Pulcheria became his regent and took a vow of virginity. Based on her charitable works, she appears to have lived her Catholic faith, as she built many churches, hospitals and public houses for the destitute. There is also a letter addressed to the saint by Pope Leo I in which the pontiff states in part, “…you clearly show how much you love the Catholic faith and how much you despise the errors of heretics.” Pulcheria is responsible for at least three churches in Constantinople that were dedicated to the Blessed Virgin – the Blachemae, the Chalkoprateia, and the Hodegetria. 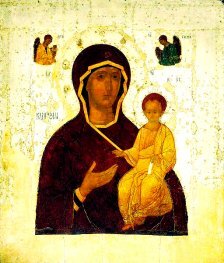 In Greek, Hodegetria translates to something like, “She who guides, or who knows the way,” which sounds quite similar to “Our Lady of the Guides,” or even, “Our Lady of the Way,” a title by which the icon was often known. The image, which shows the Blessed Mother and the Divine Child, was said to have been brought to Constantinople from the Holy Land. It was venerated at the Monastery church of the Panaghia Hodegetria, which was said to have been built specifically to house the icon, and was considered the most important “cult object in Byzantium.” On the reverse side of the icon was an image of the crucifixion. The current location of the original icon of Our Lady of Clermont is now unknown. There are many copies that have been made from the original, and many of these are miraculous, but none of them are thought to be the original. The account above mentions a Leo, Duke of Russia, and there was a Leo, Duke of Russia, who rode with the Golden Horde under Talabuga in 1287 when a raid was made into Poland, so perhaps this is the Duke Leo mentioned who took the image back to Russia. Although Constantinople did not fall to the Turks until the year 1453, it was taken by siege during the Fourth Crusade, and many important relics were taken to the west. Perhaps the icon was one of those relics. The Duchy of Opolia, or Opole, was a region situated along the Oder River in Central Europe, which was once an important trade route, and Opolia was a fortified city at about this time. There are numerous Catholic churches in Studio Clermont, Wroclaw, Poland, which is also located along the Oder River, and it may be that this was the region where the image became so heavy that it would not move any further, and that somewhere in Wroclaw was the last known location of the icon of Our Lady of Clermont.